CROSSVILLE — Jason Case of United Elevator Services works on an electrical panel for the elevator at the Cumberland County Courthouse. Severe storms that blew through the county Sunday night were accompanied by lightning strikes, heavy winds, hail, and heavy rain. Cumberland County Mayor Kenneth Carey said the elevator at the courthouse, several air conditioning units and some lighting in the courthouse were damaged by the storm. 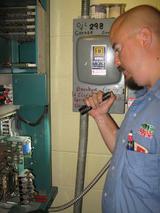 Case said all of the fuses and a couple of the electrical components were blown in the elevator’s electrical panel.